Releasing just in time for the Halloween rush, iSoftBet’s Paranormal Activity is a 5-reel sensation that promises to be the mother of scary-themed slots. 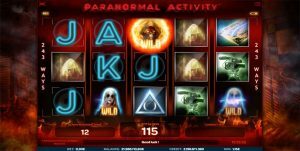 Based off the supernatural film series of the same name, in which demonic entities haunt and possess unsuspecting souls, the Paranormal Activity slot offers some unique ways to win with multiple free spin bonus rounds, as well as a petrifying Wild symbol that is sure to scare you straight. The Paranormal Activity slot is more than just a few scary costumes and some terrifying makeup. This is a film franchise that has made its name by being as realistic as possible. iSoftBet has been tasked in translating the spine-tingling and convincing handheld-camera aesthetic into a slot, and the good news is that it really does seem to mimic the blood-pumping thrills of the movies. This slot has a number of great bonus rounds, all of which are sure to have you jumping out of your seat. There are 243 ways to win, with five different Wild symbols, a bonus wheel round, and multiple free spins bonuses with different multipliers. Let’s check out the betting basics for Paranormal Activity. It wouldn’t be a Paranormal Activity slot without some scares. This slot offers up multiple ways to win with a number of different bonus rounds and multipliers, all of which feature their own terrifying animations and sounds. If there’s one thing this slot appears to do well, it turns the gaming experience into a nerve-racking haunted house ride. In the best possible way, of course. Wild: There are three different Wild symbols, and they can all be combined across all five reels to substitute for any symbol except the Scatter. Bonus symbol: If you land the ouija board bonus symbol, you’ll initiate the wheel bonus round. Here you’ll be able to win credits, additional wilds for your spin, or the five Paranormal Free Spins. 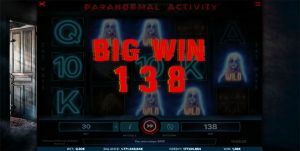 Paranormal Free Spins: Five free spins starting at 1x multiplier, increasing by x1 on every win. : Ten free spins with sticky wilds that can take up an entire reel. : 15 free spins with additional wilds and guaranteed win on all wilds. Bonus: The bonus Recording round, which takes cues from the films’ handheld camera direction, can place up to five wilds anywhere across the reels, leading to huge wins (and some frights to go along with them). You can play Paranormal Activity at our recommended sites in the casino table above, with our top vote going to Slots Million. All of these casino sites host iSoftBet online slot software and are verified by industry watchdogs like eCOGRA, are safe and regulated for player deposits, and have hundreds more games on offer from iSoftBet and other game developers.